With our extensive knowledge of the utility industry, their methods of working and our excellent network of contacts at all levels, we can help you develop your projects from inception to completion. We are an independent specialist who can provide a one-stop solution for the provision of new electric vehicle charging connections. Whether you are developing, designing or constructing small residential sites, large mixed use developments, commercial properties or infrastructure schemes, Premier Energy can support you. Take advantage of our proven and cost effective services to overcome the challenges associated with all your utility problems and requirements. 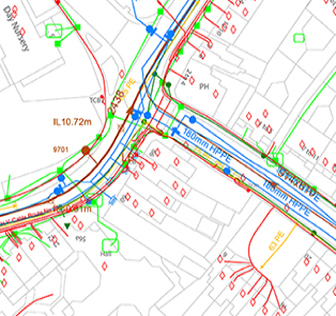 Utility search products can be used as part of your due diligence process in land and property acquisition and are a vital tool for anyone planning, designing, modifying or constructing development and infrastructure projects. The Prime is an entry-level search detailing key utilities in and around your enquiry area. The Premier is the PAS 128 Quality Level D & HSG47 compliant search providing existing utilities plans in and around your enquiry area. The Premier Asset Layered Map (PALM) transposes all C2 utility asset information from a search area on to a single interactive map referenced to OS MasterMap. Delivered as PDF and DWG. The Premier Plus is an advanced search detailing existing utilities in and around your enquiry area and providing guidance on the utility constraints and possible costs. We are an independent specialist in utility infrastructure solutions and can provide a one-stop solution for the provision of new electricity, water, gas and telecoms connections for civil infrastructure and developments projects. Our services extend to existing utility assets that could potentially affect your projects from reviewing utility asset maps to procurement of diversions, providing CAD drawing services, help track progress of your utility installation and offer support to your site staff. We can even arrange disconnection of existing services and meters to procuring your gas and electric commercial meters and supply contracts. Our eConnect service offers an independent view of the electricity connection market. This ensures you benefit from the wide range of providers available to help achieve best commercial value and technical solutions for EV charging projects. We have the ability to navigate through the complexity of electric network capacity and reinforcement charges. We will work with your design team and suppliers to evaluate, procure and implement EV strategies into one coherent plan to meet your specific needs.